Bnei Brak, Israel - Feb. 6, 2019 - Rising among the mix of small old and new buildings in the heart of Bnei Brak is the headquarters of Achiya, the Israeli nonprofit organization, dedicated to helping thousands of children achieve their full learning potential. Erev Rosh Chodesh Adar Achiya's new Donald Berman Children's Community Library was dedicated in Bnei Brak. Achiya was established approximately 25 years ago by Rav Avroham Gombo (founding principal) and Yitzhak Levin (founding CEO). Their dream began with programs for a few students in a maze of tiny rooms in an old, rundown building. Today, not far from its original location, is the The Harry and Jeanette Weinberg Early Learning Center, Achiya's headquarters, and the home of a facility in which educators and paramedical specialists help to transform the lives of thousands of children (enrolled in mainstream schools) who struggle with learning challenges. 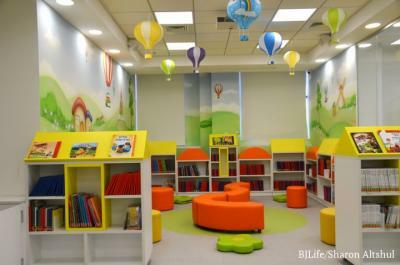 In 2016, BJL toured the impressive Achiya headquarters and met the specialists and educators who provide varied therapies for children and guidance for parents in the warm and welcoming building. The final stop on the tour was a shell of a space with raw cement walls. The dream then, now brought to life in 2019, is the children's community library designed to serve children of all abilities, in a city which offers few venues for informal education for its population of more than 76,000 children. On February 5, 2019, Erev Rosh Chodesh Adar (Aleph), the opening of Achiya's new Donald Berman Children's Community Library was celebrated by Bnei Brak officials, Achiya staff, and community and philanthropic leaders. The Library's shelves are stacked with some 10,000 books and informal educational programs are being planned, from story hours to puppet shows. Sensitive attention has been given to meeting the needs of diverse children. Magnifying equipment helps sight-impaired children enjoy the pleasure of books. A computer generates large screen images of books placed below it. Other adaptations will assist children with a range of special needs. Hebrew books are available for children of a range of ages. For children whose families preserve Yiddish heritage, thoughtfully developed Yiddish books were published and are available, specially bound for the wear and tear of heavy library usage. There are also books to help Yiddish speaking families to learn Hebrew. Colorful, comfortable and inviting spaces are dedicated to reading. A special section of the Library has computers with access to databases enabling older students to do research. There is no internet, but teachers can utilize a resource room, its content is available to educators worldwide and can be found HERE. Achiya CEO Yitzhak Levin affirms that the creation of the Library in Achiya's home and headquarters is a natural extension of the Achiya mission: "We want the Haredi community to have access to state-of-the-art therapeutic methods to help children overcome learning challenges. Our teachers' colleges throughout Israel provide Haredi educators with professional training so they can identify our children's needs for early intervention. We want all our children to achieve their full potential." The dedication of the Library is a significant milestone for Achiya, which has achieved full accreditation from Israeli government Ministries, and is recognized as a leader identifying and treating learning differences in communities in Israel and overseas. The dedication ceremony was moderated by Yitzhak Levin, who introduced Rav Gombo, principal of the largest Talmud Torah (boy’s school) in Bnei Brak and the director of the national Committee of Talmud Torah Schools. He is a respected educator and the supervisor of Achiya's educational staff. Shmuel Weinglas, director of a division of Israel's National Insurance lauded the Library for its leadership in creating a space for reading and informal learning for children of all abilities. Mr. Weinglas was also honored with the unveiling of the plaque in Achiya's lobby which acknowledges the support of Israel's National Insurance Institute. There are yet more challenges on the horizon. Achiya is now planning is a new child development center in Elad, a rapidly growing city in Israel's central region. The Wohl Foundation is taking a lead role in bringing that vision to life and the plan for that building was on show at the entrance to Achiya's Donald Berman Library. Among the guests at the dedication were Michal Herzog of the Wohl Foundation, representatives of the IDB, and professionals who lead Achiya's diverse programs, and social worker Sharon Porat from the JDC-Ashalim. The Achiya event reflected the spirit of inclusion of its new Children's Community Library as the speeches delivered were accompanied by simultaneous interpretation in sign language. CEO Levin, Director of Resource Development Tzivia Greenberg, with the able assistance of consultant Rachel Grunbaum, now proudly claim the new state-of-the-art children's community Library as its contribution to enriching the lives of thousands of children and families in Bnei Brak, a model for inclusion for children of all abilities. One small finishing touch has yet to be completed--the sign in the elevator to announce the third floor Library.